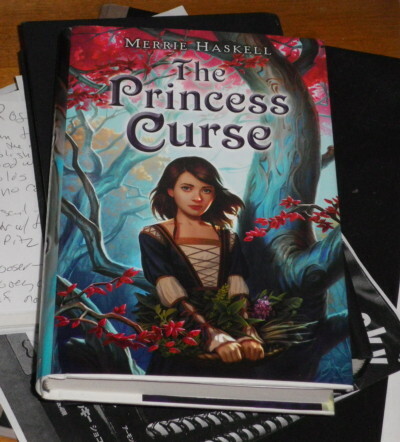 The above book is the first book of local author Merrie Haskell (as it says on the cover). Badmovie is a long time friend of hers (back in the confer days. You’re way back old school if you are form the confer days) so we went to see her talk at the Grad about the book. It was pretty cool (and I have pic! The (s) part of pics didn’t come out very well, sadly, but I have one that did) and there was cake. Because we were promised cake. I did not pick up the book at the signing though but later Badmovie was out and about and around and asked if he should get me one. It’s a good read, you should get you one too. 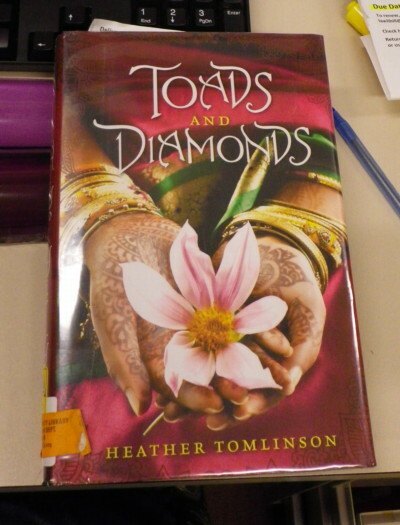 This book is the other book I am reading which is on Inter Library Loan. It was showcased on Scalzi’s Big Idea and when I looked at the cover I said, “OooOOooo shiny!” then I read what the author had to say and I thought, “Hey, *I* am a big sister, this sounds cool.” Plus, I liked what she had to say about step sisters and mothers and time old tradition thereof. So I had my minion order me up the book. Also new today, Fresh Scoodgie! The old scoodgie is the dark purple fella in the front, the new scoodgie is in the back. Old scoodgie…well I guess scoodgies are flexible but only to a point. If you worm one around your desk while reading or whatnot (what? You’d worm a scoodgie too if you knew how fun and flexible they were. 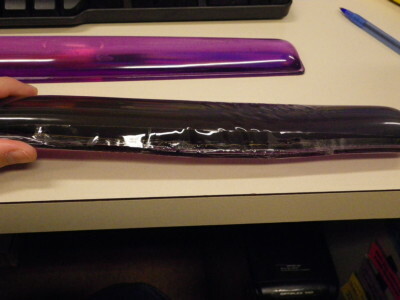 It’s like doodling but with a giant purple wrist rest which moves like contained finger jello. AWESOME!) you can break it. This made me all sorts of sad because the analogy to finger jello is even more apt when the scoodgie’s insides are exposed. They are kinda gunky. And yucky. But! 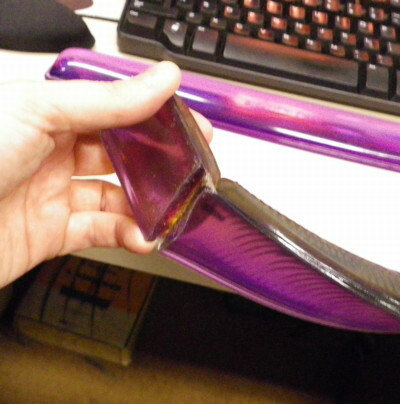 The split wasn’t what finally retired my scoodgie. It had an air bubble at the base which became a bigger air bubble that traveled along the crease between the goojie top and the stiff desk flapping bottom. That was weird but OK. Then the bubble popped and the skin started to separate away from the sticky gooj and it got all…floppy. And yucky. I taped it up (There! I Fixed It!) so that the disturbingly tacky innards would stay in and not climb all over my hands but a new scoodgie had to be ordered. 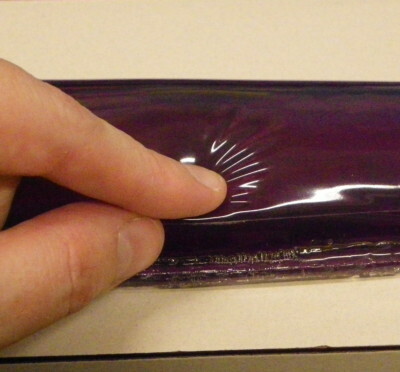 Today, my new scoodgie arrived and it’s a lighter purple (boo!) and not as tall as the old one, but it’s not broken either. Farewell old scoodgie, you served me well. 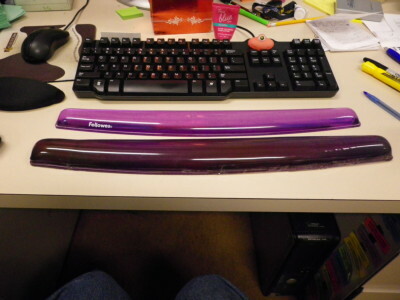 And also, I wonder if being less thick means I can worm my new scoodgie more? 2010: Patti and her squeeze celebrated their 10 year anniversary at the brewpub and invited us all. 2009: Michener Everett Nefling is secure enough in his young manhood to wear awesome blue monkey jammies with pink piping. 2008: JSFR: Toppo for Men. 2007: Well, it’s a big piece of hulking feces so I might as well use it for something and all that blank space cries out to be covered in doodle art. 2006: I’ve gone more than 24 hours without washing my head and by the time 30 hours rolls by I can use my head to grease cooking pans. 2005: Nothing says welcome to this world little one like DEATH SPICES! 2004: Sadly, no Advil, Sudafed, Flovent, Drinking, Smoking or drug use for me come 2005. Damn, there goes my heroin habit. This entry was posted on Wednesday, December 7th, 2011 at 8:19 pm	and is filed under General Bloggery. You can follow any responses to this entry through the RSS 2.0 feed. You can leave a response, or trackback from your own site.